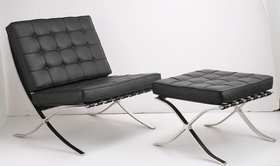 The Barcelona Chair was designed for the German Pavilion, Germany's exhibition for the Barcelona World Fair of 1929. The design resulted from collaboration between the famous Bauhaus architect Ludwig Mies van der Rohe and his longtime partner and companion, architect and designer Lilly Reich, whose contributions have only recently been acknowledged. An icon of modernism, the Barcelona chair's design was inspired by the campaign and folding chairs of ancient times. The frame was initially designed to be bolted together, but was then re-designed in 1950 using stainless steel, which allowed the frame to be formed by a seamless piece of metal, giving it a smoother appearance. Bovine leather replaced the ivory-colored pigskin which was used for the original pieces. 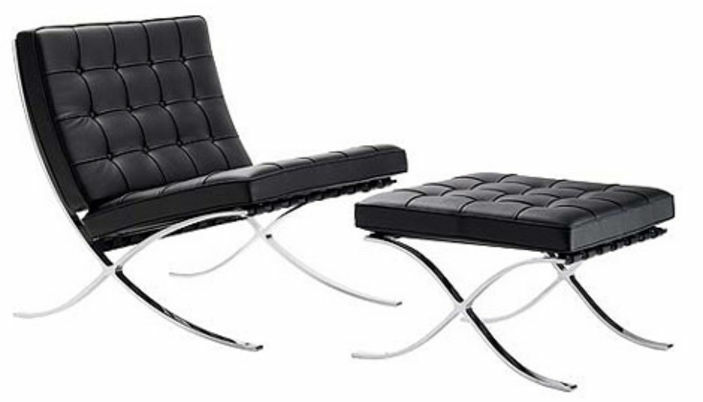 In 1953, six years after Reich's death, the design went into commercial production and van der Rohe licensed the rights of reproduction to Knoll, the current licensed manufacturer and holder of all trademark rights. Today Knoll manufactures the frame in two different steel configurations, chrome and stainless. The chair is almost completely hand-laboured. Ludwig Mies van der Rohe's signature is stamped into each chair. Unauthorized reproductions proliferate worldwide and are sold under different marketing names. Lilly Reich began working for the Deutscher Werkbund in 1912, an organization whose raison d'etre was to focus specifically on the German design industry, its quality, evolution and promotion. Reich was responsible for designing and organizing many of the Werkbund's international exhibitions, and in 1921 became the organization's first female member. Reich and van der Rohe met in the mid-1920s and collaborated on many of these exhibition design projects until he departed for the United States in 1938. While Reich always deferred to van der Rohe in public, the reverse was said to have been the case in private. While it is naturally difficult to apportion the contributions that each made to a particular design, it is interesting and poignant to note that van der Rohe never again produced any furniture designs after their partnership ended, nor had he designed any furniture beforehand. His first patent on a furniture design was issued in 1927 and his last in 1937. AS A DESIGNER...i think he was one of the best! opened my mind !